Jordan is back with some numbers to help you make some good choices. Hi guys, Jordan here again. Today we are going to look at how popular captain choices performed in aggregate against each team last year. The goal is to get a better idea of when to pick a player (and not pick them) as captain based on who they are playing that week. Obviously there’s a lot to consider when picking a captain such as form, injury, taggers, history against the opposition, venue, etc, and Calvin’s your man for that. This is just a simple look at who were the easiest teams to score against last year. For the analysis I’ve picked players who I think represented viable captain choices last year and have grouped them into two groups, mids and rucks. What was important in deciding the groups was what position the player actually plays, not their AFL Fantasy positions. The reason for this is that we are looking at how easy/hard it is for a player of a particular position (say midfielder) to score against a given team. Fantasy positions affect where we can pick a player in our fantasy teams, not where the player actually earns their points on the field. I didn’t look at defenders and forwards because there aren’t many pure defenders or forwards that are viable week in week out captain choices. Mid: Sloane, Rockliff, Zorko, Gibbs, Treloar, Pendlebury, Sidebottom, Adams, Merrett, Neale, Fyfe, Dangerfield, Selwood, Hall, Ablett, Coniglio, T.Mitchell, Lewis, Viney, Wines, Martin, Steven, Parker, Hannebery, Kennedy, Priddis, S.Mitchell, Shuey, Hunter and Bontempelli. Rucks: Gawn, Grundy, Goldstein, Martin. Unsurprisingly Essendon take out No1 spot followed by Gold Coast with Fremantle rounding out the top 4. 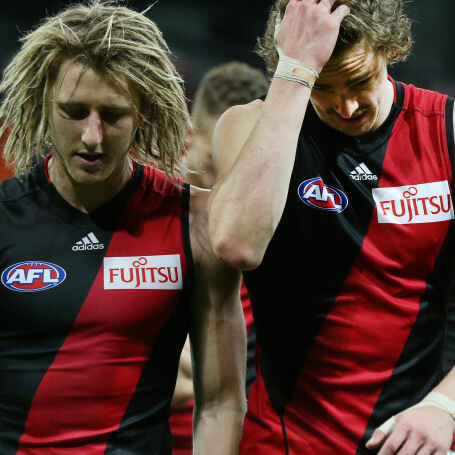 All three team’s engine rooms were severely undermanned last year and at least in Essendon’s case we shouldn’t expect this to be as severe in 2017. I would expect Fremantle and Gold Coast to continue to blood their youth in 2017 and thus they should remain good opportunities to pick your captain against. Also as expected GWS proved to be a hard team to score against and I can’t see this changing in the new year. Avoid picking captains playing GWS. On the other side of things I was particularly surprised to see West Coast, Collingwood and Geelong end up where they did. Over here in the WA, West Coast copped a lot of criticism for effort last year. I’m not a West Coast supporter so I don’t know if this was aimed at their midfield in particular (WC supporters feel free to jump in) but their midfield is pretty talented and with the addition of Sam Mitchell I can see them going head 2 head with the opposition rather than trying to nullify their mids. Hopefully this means continued high scoring by opposition mids. Geelong take out the No1 spot on the stingy end of the scale and looking at the individual scores it isn’t because a disproportionate amount of players got injured or anything. Geelong are clearly a hard team for gun mids to score against and if I had to guess I’d put this down to the contested ball ability of the Danger-wood combo. I don’t see much changing in 2017 so avoid picking captains against these guys. 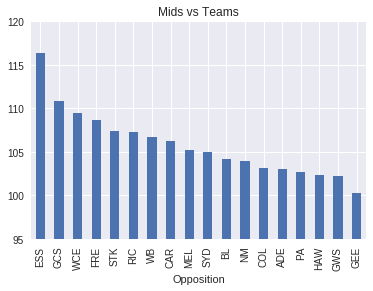 Most surprisingly of all (for me at least) is to see Collingwood fall in the bottom half of the distribution. I don’t know how many times I picked a captain playing Collingwood last year based on the “Collingwood no tag” factor but clearly I was misguided. Looking at the individual scores the highest was a 137 by the Bont and there was a fair amount of real average scores dished out by premium players. I guess with the Collingwood mids being such prolific ball-winners there’s not enough DT points to go round? Whatever the reason, I’ll be thinking twice before picking a captain against them in 2017. Other teams to take note of include Richmond, Hawthorn and Brisbane. Changes in personnel at Richmond and Hawthorn could see scores against them change in 2017 and we are yet to see the effect of Fagan’s game plan at the Lions. /1. 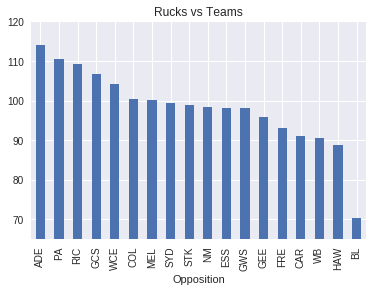 Teams with injuries to key rucks tend to be easy opponents. Pretty obvious. /2. Sam Jacobs seems to give up a lot of points. This ones a little unclear as we only have 4 games to go off but the picture is the same looking at 2015. Might be worth putting the big C on your No1 ruck when they play him. You’re my hero. Could I possibly grab a scotch or two with you one day? Really? I’m not a fan of Bummer Buffy (which she is so often). I like the college years much, much better. And I think Season 6 is my favorite because there is so much Willow. Also, singing Anya. Who should I start with?